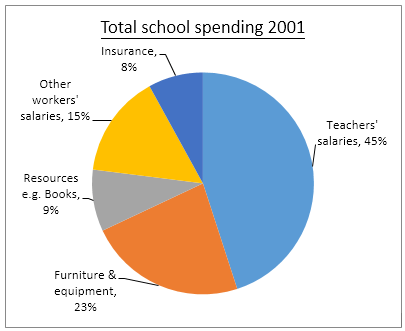 Home IELTS Academic Writing Task 1 Model Answer – Pie Charts – Annual spending by a particular UK school in 1981, 1991 and 2001. 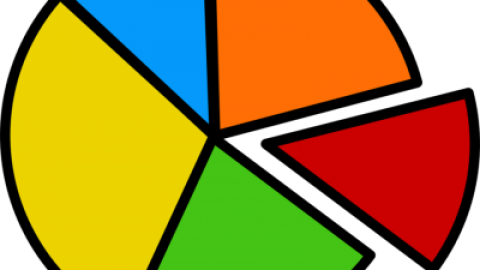 These three pie charts compare between the percentage of the annual expenditure in a certain school in the United Kingdom in three different years 1981, 1991, and 2001. Firstly, tutors` salaries stood at two-fifths of the annual spending in the early 80s, increased by about 10% after one decade then slightly decreased to 45% by the beginning of the twenty-first century. Secondly, the payment of the other co-workers declined steadily from 28% in 1981 to 22% and 15% in 1991 and 2001, respectively. Furthermore, the amount of spending on furniture and equipment dropped dramatically from 15% in 1981 to almost 5% in 1991. However, it rose to just below five times by 2001. On the other hand, the percentage of expenditure per year showed an upward trend in the three years from 2% in 1981 to approximately four times in 2001. In addition, the annual spending on school resources such as books fluctuated in the three years. Since it showed initial rose from 15% to 20% in 1991. Onwards it declined to just below one in ten. To conclude, it can be clearly seen that teachers, salaries represented the major portion of the annual school expenditure in three years. IELTS Academic Writing Task 1 Model Answer – Pie Chart – The main reason why agricultural land becomes less productive. IELTS Academic Writing Task 1 Model Answer - Diagrams - The stages and equipment used in the cement-making process, and cement production for buildings.IELTS Writing Task 2 Model Answer: Unpaid community service should be a compulsory part of high school programmes. Agree or Disagree?